Fluffy and flavourful, these Baked Blueberry Donuts are your coffee’s bff! 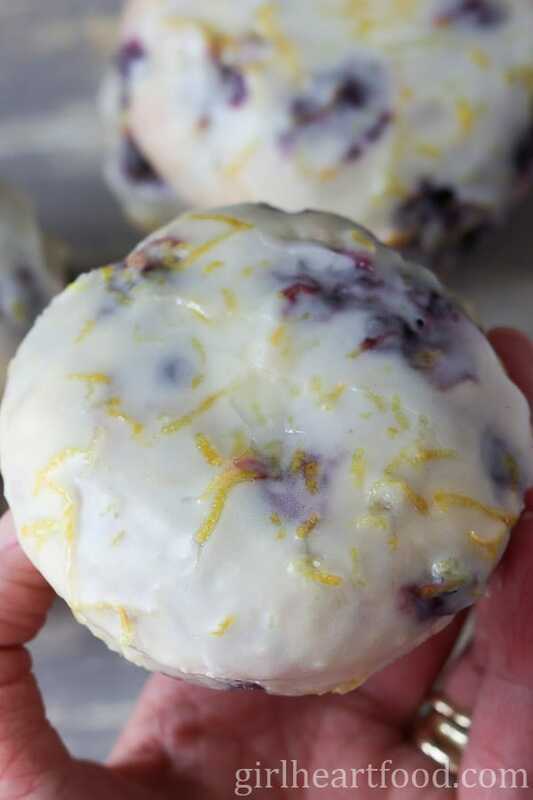 Topped with a simple Lemon Glaze with flecks of fresh lemon zest, these baked donuts make for one delicious treat! Hey everyone! How was your weekend? Did it fly by, as always? 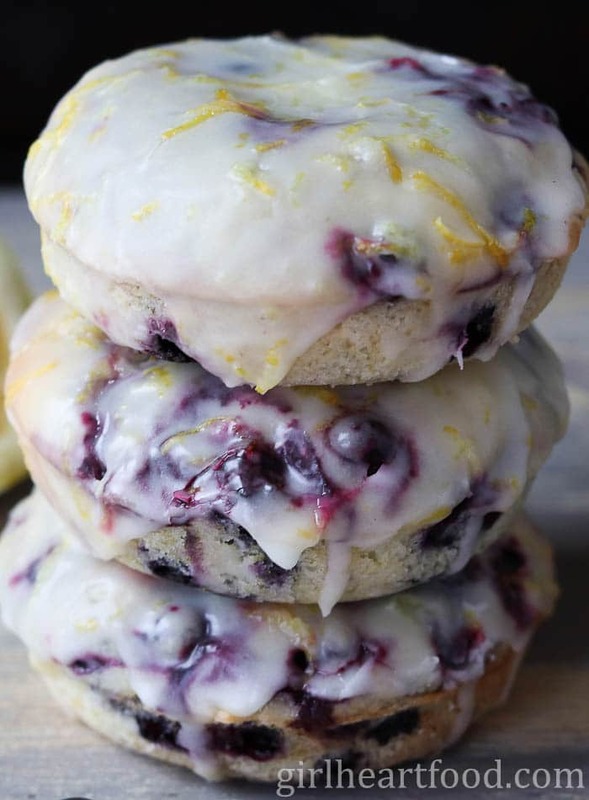 What better way to ease into the week than with these Baked Blueberry Donuts, don’t ya think? With just some simple ingredients, you could be on your way to the best homemade baked donuts you could ever shove in the ol’ pie hole! Besides how tasty these are, one of my fave things about these baked donuts is that you don’t even have to haul out the big mixer. Just use a large bowl and way to go! That still doesn’t stop me from making a mess, but least I try, lol. I used the remainder of the local wild blueberries that my pop gave me last year that I had stashed in our freezer, but fresh blueberries would work lovely! Don’t overwork your blueberries. You don’t want to break them out and have them bleed too much into the batter. Not that that’s necessarily a bad thing, if you ask me. Let the baked donuts cool completely before icing. These donuts fluffed up when baking so the centre hole is pretty much enclosed and I simply glazed the whole top -creates a lil’ pocket for more glaze! Best enjoyed the day of making…that shouldn’t be a problem! Hope you love these easy baked donuts as much as I do! Fluffy and flavourful, these Baked Blueberry Donuts are your coffee's bff! Topped with a simple Lemon Glaze with flecks of fresh lemon zest, these baked donuts make for one delicious treat! Preheat oven to 425F. Generously spray 6 unit donut pan with baking spray. 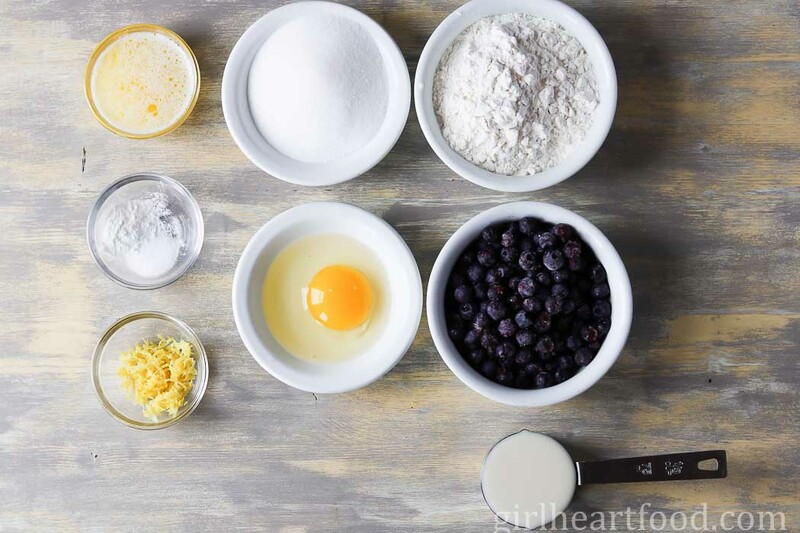 In a large bowl combine flour, sugar, baking powder, and salt. Stir to combine. In a small bowl whisk together almond milk, egg, melted butter, vanilla extract and lemon zest. Add to dry ingredients. Whisk to combine. 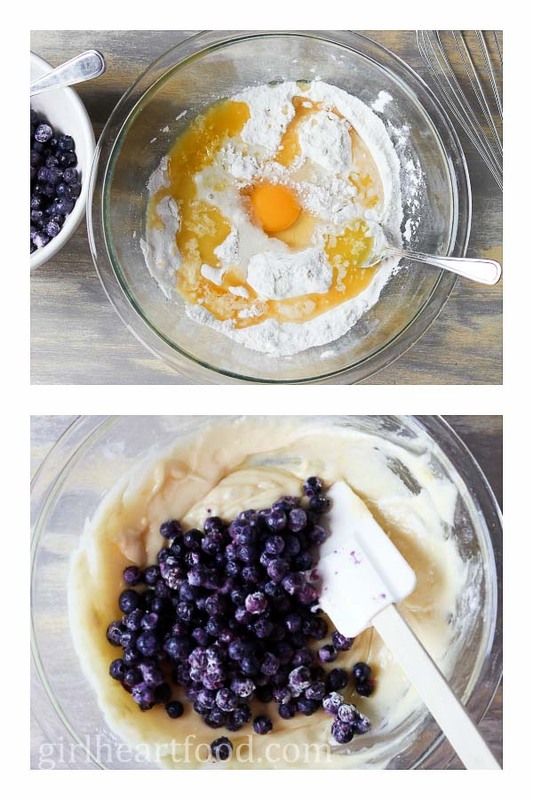 Toss blueberries with 1 tbsp of flour and gently fold in berries to wet batter. Mixture will be thick. Distribute mixture in donut pan. You can pipe mixture in or spoon. 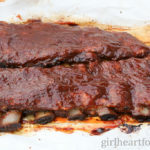 Bake for 12-13 minutes or until wooden skewer comes out clean. Let cool in pan for about 10 minutes before gently removing and cooling on wire rack. Dip cooled donuts in lemon glaze and place on wire rack to set. Best enjoyed same day. I used frozen berries, but fresh blueberries would work lovely! Don't overwork your blueberries. You don't want to break them out and have them bleed too much into the batter. Not that that's necessarily a bad thing, if you ask me. These donuts fluffed up when baking so the centre hole is pretty much enclosed and I simply glazed the whole top -creates a lil' pocket for more glaze! Best enjoyed the day of making. I was wondering if it would be okay to use regular 1% milk since I don’t have any almond milk in my fridge. Hi Sandrea, thanks for stopping by 🙂 Yes, that will work! The vanilla almond milk adds another little bit of vanilla flavour, but 1% milk is absolutely fine to use. Hope you love them! Thanks so very much, Valentina 🙂 They’re pretty delish! That glazed icing is perfection! 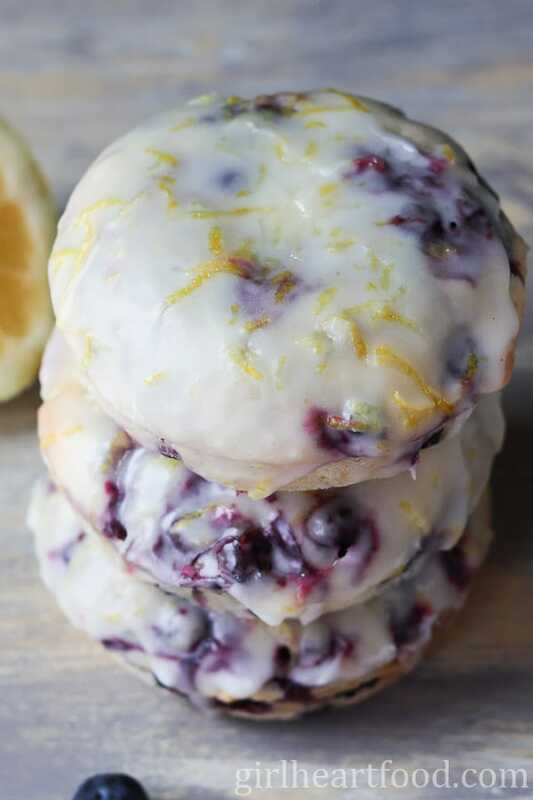 Lemon and blueberry is such a great combination.